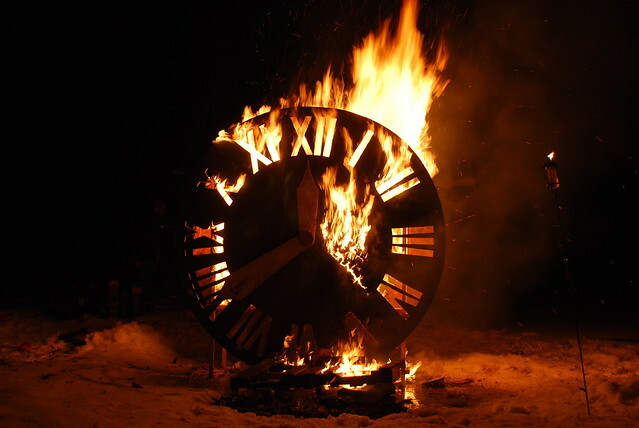 the burning clock | Flickr - Photo Sharing! Every year my friends and I build a burning thing for new years. This one was 8 feet tall, consisted of two 8 foot circles of plywood connected with a 2 foot deep box frame in center. The minute hand was operated with a copper pipe from the back. Construction used burnable dowls to minimize metal debtris after fire. The blaze mark on the frozen lake was big enough to be seen in Google earth.